Residential-style showers with an open-concept design are available in certain 2019 Jayco fifth-wheel floor plans. Several of Jayco’s 2019 fifth-wheel models are equipped with an amenity that company officials say is a first for towable RVs — oversized, residential walk-in showers. The showers are available in four 2019 Pinnacle floor plans and all 2019 Seismic toy hauler floor plans. The shower measures 30 inches by 57 inches and features a skylight, lightweight tile, a vertically adjustable and detachable showerhead, a teak fold-down bench with a 300-pound capacity, and a stainless-steel drying rack and shelf. The shower has an open-concept design; half of the shower’s length is contained by a wall, with glass on the top and ABS tile on the bottom. 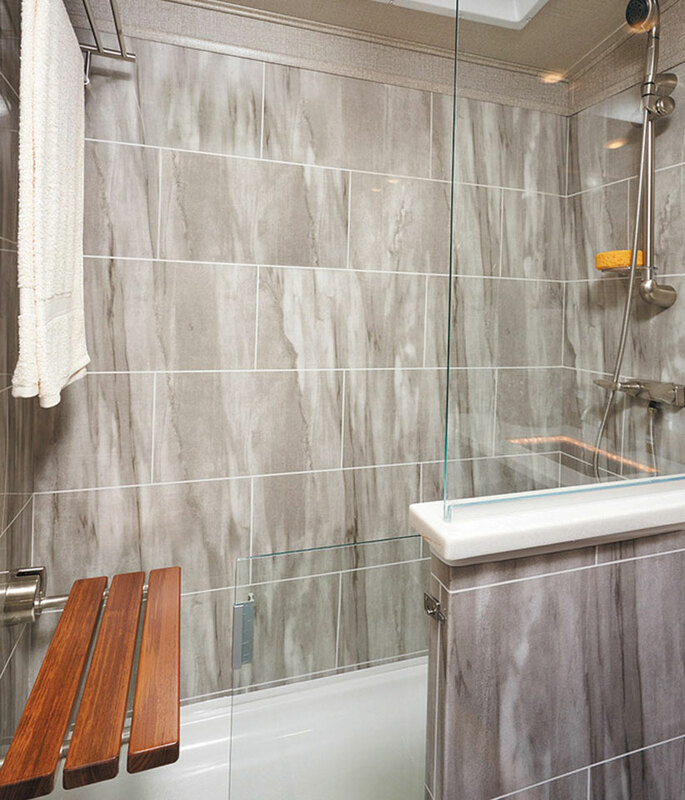 A sliding glass door protects the shower’s open portion. For more information, call (574) 825-5861 or visit www.jayco.com. Along with the new Coastal Cottage design, the Bullet will incorporate painted hardwood cabinets with hidden hinges and Furrion stainless-steel appliances. For more information, including Bullet floor plans and a 360-degree virtual tour, visit www.keystonerv.com/travel-trailers/bullet. Or call (866) 425-4369. The RV Women’s Alliance, an organization dedicated to mentoring women in the RV industry, is expected to formally launch in March 2019. Membership in the alliance is open to men and women. A group of women representing RV dealers, suppliers, media, and association staff met during the RV Dealers Association convention in November 2018 to discuss starting and building a sustainable organization. Organizers say the vision is to elevate the roles and contributions of women in the RV industry by promoting diversity and providing programs, resources, and a collaborative environment for women who are pursuing RV-related careers. To join the alliance, visit https://nbminc.wufoo.com/forms/membership-form/. The California RV Show, which has doubled in size over the past eight years, has a new venue for 2019. It will take place October 4 to 13 at the Auto Club Speedway in Fontana, which offers more built-in amenities for RV manufacturers, dealers, and RV consumers. The event, which displays thousands of RVs from major manufacturers, also will feature live music, educational seminars, and celebrity appearances. The move to the Auto Club Speedway was made possible by the RV Industry Association’s government affairs team and Mike Belote from California Advocates Inc. They worked with the California RV Dealers Association, the California legislature, and the governor’s office to ensure passage of a bill amending the state’s RV show law to allow the event to take place within 30 miles of the previous show location. For more information about the show, visit californiarvshow.org. Fleetwood RV’s top-of-the-line Type A diesel motorhome, the Discovery LXE, comes with major design upgrades for the 2019 model year. Fleetwood RV is a brand of REV Recreation Group. The Fleetwood Discovery LXE boasts major design upgrades for the 2019 model year. The 2019 Discovery LXE is built on a Freightliner Custom Chassis and integrates Fleetwood RV’s Power Bridge frame. The motorhome is available in five floor plans, ranging from 40 to 44 feet long. Depending on vehicle length, the coach comes equipped with either a 380-horsepower or 450-horsepower Cummins engine. Standard features include an exterior 48-inch LED TV; an integrated roof-mounted patio awning; polished porcelain tile; Apex furniture; an Aqua-Hot system for heat and hot water; a full-tile shower; front-zone tile floor heat; a residential refrigerator and induction cooktop; a 10-inch in-dash touchscreen Bose sound bar; and a Firefly command center for house electronics. An optional technology package is available. The manufacturer’s suggested retail price starts at $361,741. For more information, call (800) 854-1344 or visit www.fleetwoodrv.com. Chinook Motor Coach Corporation expects to begin building Type B and Type B-plus motorhomes at its remodeled Elkhart, Indiana, factory early in 2019, Jeff Butler, Chinook’s general manager of plant production, told RVBusiness.com. Chinook invested nearly $2.5 million to retool and update the plant. Several Chinook motorized models are planned, Mr. Butler said. One will be called the Concourse; another is the Premier. More are in the works. He said plans call for models to be built on the Mercedes-Benz Sprinter chassis, the Ford Transit chassis, as well as Ford Super Duty E-350 and E-450 chassis. In addition, Chinook is expected to soon begin producing towable RVs at the Peru, Indiana, plant that it purchased in 2018 from Vohne Liche Manufacturing. The towables will carry the RT Trailer Corp. brand. Chinook was a well-known motorhome manufacturer for decades until its bankruptcy in 2005. Phil Rizzio, an owner of several RV dealerships, bought the Chinook brand in 2013. He is serving as president and CEO of the company. Charleston Harbor Tours has acquired ACE Basin Express, a nonstop shuttle that offers direct transportation between the cities of Charleston, South Carolina, and Savannah, Georgia. Charleston Harbor Tours now owns the ACE Basin Express, which shuttles guests from Charleston, South Carolina, where they can view sites such as Waterfront Park (shown here), to Savannah, Georgia, another popular destination. The ACE Basin Express offers daily, one-way departures on a 14-seat Mercedes-Benz Sprinter bus. It picks up Charleston guests at the Visitor Center or at their hotel, and drops them in Savannah at their destination hotel or at the Hutchison Island Ferry, which then takes visitors to the historic district. The bus then returns to Charleston carrying Savannah visitors. For reservations, call (843) 762-0088 or visit www.basinbus.com.